Frenchies cannot swim. The can’t do heat…or cold for that matter. They snort. There’s snoring, lots of snoring. They even breathe loudly. If this sounds familiar, it should. Almost every kind of bulldog has these afflictions, but for true bulldog lovers, it’s part of the charm. However, the French bulldog rarely drools and they don’t typically have an extended teething and chewing period. They don’t shed as much, having two heavier seasons and then very minimal. And they have almost non-existent exercise requirements, unlike many other bully breeds. It’s pros and cons, people! Adding a new furry family member can be a daunting task. It can be even more difficult if you haven’t shopped for a new pet in many years or ever in your life. The landscape of the puppy buying world is ever-changing and many people don’t know where to start. But that’s where we come in! At Petland, we pride ourselves on being experts on matching the right pet with the right family and meeting the needs of both. Our dedicated, knowledgeable Pet Counselors have dog breed information all but memorized and can definitively answer any questions you might have. We strive to continuously raise the bar for our customer experience to buy puppies and it shows! Think you’re ready to buy puppies at Petland Mall of Georgia? We think so! Check out all of our wiggly, cuddly little puppies on our available puppies page! Our Basset Hound Puppies Will Melt Your Heart! Those sad eyes, wrinkly faces and trip-over worthy ears, our Basset hound puppies will be love at first sight! The Basset hound is thought to come from as far back as the 1500s when the French were using low slung, heavy-bodied hounds to trail rabbits. The word “bas” is French for “low” befitting the Basset hound’s signature stature. For hunters, the Basset was the ideal companion as its slow and steady gait was easy to trail after. In the United States, the Basset quickly moved on from hunting dog to beloved family pet. Familiarized to the public by cartoons, commercials and mascots, the Basset remains a very popular large breed dog to this day. This laid-back breed is easily one of the most recognizable in the dog world, but what else do you know about Basset? Don’t worry, that’s where we come in! Read on for interesting facts about the Basset hound. Petland often has Basset hound puppies for sale, check them out on our available puppies page! Bassets are heavy-boned dogs with a thick body on short, stubby legs. Because they are a large breed, Bassets are slow maturing dogs, often not reaching full size until two years old. They have an average weight of 40-80lbs! The Basset has a short, shiny coat that comes in typical hound colors: red and white and tri-color, with ticking being fairly common. They don’t require much grooming and are considered average to heavy shedders. The Basset hound is a friendly, outgoing breed. Originally used hunting with a pack, they tend to be good with other dogs and other pets. Bassets are people oriented and get along well with children. Because they are hound dogs, they have that deep baying bark typical of the category. They do better having a bigger environment and yard, even though they have minimal exercise requirements, as they like to wander scenting around. Bassets need patience and a firm hand with training. They have a keen mind, but get distracted easily. Think you’ve got what it takes to be a Basset hound owner? We think so too! 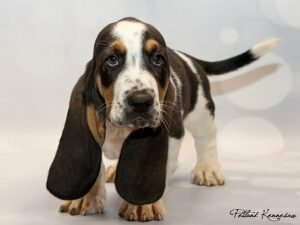 Give us a call today to learn more about the Basset hound puppies in our store! Boston Terrier for Sale: These Dapper Dudes Love a Good Time! A fun, playful breed, a Boston terrier for sale is a great choice for people who want a cheerful and energetic companion! 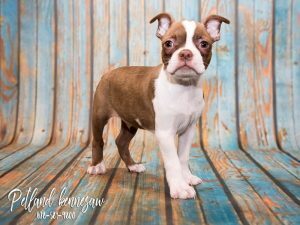 There is so much that makes the Boston terrier a great addition to all sorts of families! Many people don’t realize that they are one of the only dog breeds to be bred originally in the United States from, you guessed it, Boston, Massachusetts! Boston Terriers are affectionately known as the “American Gentleman” of dogs due to their origins and the tuxedo-like quality of their black and white coats. They have been an American staple since the 1960s and have thrived in households due to their fun, affable nature. Think the Boston might be right for your family? Keep reading for interesting facts about the temperament and characteristics of the Boston Terrier. 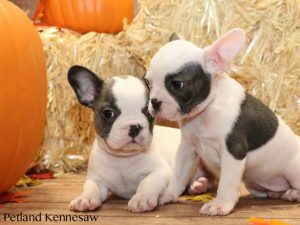 Want to see pictures of the Boston terrier for sale in our store, check out our available puppies page! Boston terriers have a look and personality that make you sit up and take notice! Bostons have a short, smooth coat that is almost shiny in appearance. They are either brindle with white markings, black with white markings, or seal (a chocolaty red) with white markings. And their tails are either cute little nubs or “screw tails” that resemble a piglets. So stinking cute! They vary greatly in weight and be as small at 14lbs and go all the way up to 28lbs! They have an average lifespan of about 12-14 years because of their smaller stature. Bostons certainly require exercise, as they are an energetic breed. However, a few short play sessions daily or moderate walks are better than long exercise sessions. Because of the flat nature of their faces, they can get overheated from extreme play or weather conditions. The Boston does great with children and other pets. They are heartier than other small breed dogs and can handle a little rougher of a play time. An occasional bath, supplemented by brushing, is really all that’s needed to keep the coat looking good. This will also control shedding, which occurs, but is minimal in this breed. Unfortunately, there is so much more to the Boston terrier breed than we can get into today! Feel free to give our knowledgeable Pet Counselors a call with any additional questions about our Boston terriers we have for sale in our store. We can definitely agree on one thing, Boston terrier puppies are good at giving lots of puppy kisses! Chihuahuas for Sale: Our Saucy Puppies Want to Go Home with You! If you’re searching for Chihuahuas for sale, look no further! Petland has all the feisty Chihuahua puppies you can snuggle! The Chihuahua breed is considered the smallest dog in the world, but you wouldn’t know it from their big personalities! And believe it or not, the Chihuahua wasn’t just popular from the fast food commercials of a few years ago, or the Legally Blonde movies. Chihuahuas are considered one of the oldest North American breeds still in existence and were actually considered sacred at one point in their histories, so they’ve been around the popularity block a time or two. Despite their many years in the spotlight, the ever saucy Chihuahua has some personality traits that might not go with every family. Because of their size, they need a lot of extra care and attention. Read further to find out more about this enchanting little breed! Want to see pictures of our precocious Chihuahuas for sale, check our available puppies page! Chihuahuas are considered the ultimate companion. They like attention from their owners and are very loyal. Even though because of their size they are considered lap dogs, they are active and like to be played with. They come in two distinct coats: shorthaired, which is considered the most popular, and longhaired. The longhaired version has soft, very fine hair that feathers off their legs and ears. Chihuahuas can come in any color combination and are considered the “snowflakes” of the dog world as each one is unique. The have an average size that varies from 4-10lbs. Despite being such an old breed, they have no inherent health problems and have an average life span of 15+ years. Chihuahuas are good family pets when treated respectfully, but they have a reputation for being wary or aggressive with strangers or small children who may be threatening to their diminutive size. They tend to bond with one person, so it is important for the family to share in taking care of the puppy. The Chihuahua is considered an excellent guard dog. They will bark and “defend their households” against threats, despite not being able to do much being so tiny! The Chihuahua can be a wonderful pet for many different people! But this was just a small look into what makes the Chihuahua breed tick. So if you’ve got more questions about our Chihuahuas for sale, never hesitate to give our Pet Counselors a call! Or come in today and see all of our adorable puppies in person. Corgi Puppies Aren’t Just for Royalty, But Your Family Too! That’s right, people! Pembroke Welsh Corgi puppies aren’t just made for the Queen, they can fit in anywhere! Pembroke Welsh Corgis are immediately identifiable by their short stature, prick ears and foxy face (with or without a queen included!). This quirky little breed originally hails from Wales, like their name implies and were herding dogs for farmers. With their fierce intelligence, eagerness to please and short little bodies, they made the ideal farm hand. While the Queen of England is credited for bring the Corgi into the mainstream of dog owning, the breed does a great job of stealing people’s hearts as a beloved family pet. Have you seen the Corgi, but aren’t sure if one might be right for your family? 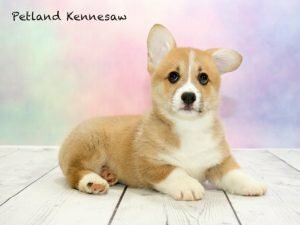 Read further in our blog to find out fun facts about the personality and characteristics of Pembroke Welsh Corgi puppies! Corgis have weatherproof double coats that are short and smooth to the body. The color ranges from a rich red or fawn to black or sable with white markings. The blacks usually have white and tan to make them technically tri-colored in appearance. Because of their herding background, Corgis are a hearty, energetic breed. They require daily exercise and playtime to keep them happy and entertained. They typically weigh around 22-28lbs and have an average lifespan of 10-12 years. Most Corgis are fine with other pets and children if they have been raised with them. Beware that they will sometimes chase the heels of small running children because of their herding instincts! They need a firm and patient hand with training, because they can be willful. But we find treats help with any kind of puppy training! Think that Pembroke Welsh Corgi puppies might be right for you and your family? Well, check out all our adorable Corgi puppies on our available puppies page! You can also always give our Pet Counselors a call to make an appointment and get in some puppy kisses today! 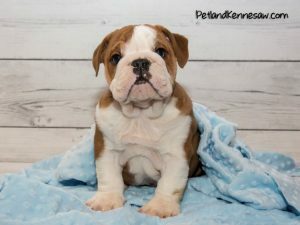 English Bulldogs for Sale: Stop By Petland Mall of Georgia Today! The English bulldog is exactly what it sounds like, a squat, powerful breed originating from the British Isles. While they have moved from a working past to a lovable family companion, the English bulldog continues to charm and “bully” its way into people’s hearts. Here at Petland Mall of Georgia, we find that their are few people that can walk past an English bulldog puppy without completely melting! But there are so many more qualities to the bulldog that make them great pets for many types of families. We want to explore deeper into the personality and characteristics of the English bulldog in our newest blog. Want to check out our available English bulldogs for sale before reading further? Just click here! They thrive best in temperate climates because of their flat faces. They readily overheat and have breathing difficulties in hot weather, and they chill easily in cold temperatures. So keep them inside as mush as possible in extreme weather! Sheltie Puppies for Sale, Why You Need One of these Precious Pups! 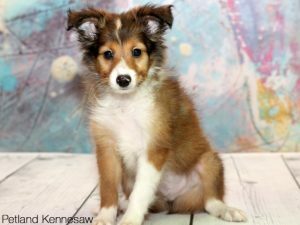 Sheltie puppies for sale are some of the sweetest and most beautiful around and Petland has them! The small, active Shetland Sheepdog, affectionately nicknamed the Sheltie, was once a Scottish farmer’s best friend: sounding the alarm when anyone approached the property, barking at birds and other animals to shoo them from the garden, and later, with crosses to Scottish herding dogs, keeping the sheep flocks in line. While at first glance they look like a smaller version of the Collie, the two are distinctly different breeds. Now, the Sheltie puppies for sale are mostly a family pet and very popular ones to boot! The Shetland Sheepdog stands between 13 and 16 inches tall at the shoulder, but it’s not unusual for them to be over- or undersize. A typical Sheltie weighs about 22 pounds, but a large one can weigh as much as 35 or 40 pounds. They have an average lifespan of 12-15 years. Shelties are loving companions for all members of the family, including the kids, but they can be reserved or even shy around strangers. Because of their protective nature, they’re quick to bark if they sense that anything’s amiss in their territory. Because of their intelligence, willingness to please, and athletic ability, Shelties excel at performance events. However, they have a drive to be active and they need several walks and playtime daily to be happy. They can do well in many different environments, as long as they can be near their owners and have ample playtime. While Shelties are very smart, you need to have patience while training them. Make training fun, with lots of affectionate pats and treats. Treats are always the best way to your pup’s heart! Even though Shelties are a popular breed, they can be hard to find! That’s where Petland comes in! We buy from only the most caring, reputable breeders and we stand behind our puppies 100%. Want to check out all of our Sheltie puppies for sale, click here for our available puppies page. And, as always, give us a call to make an appointment to come get some cuddles today! Puppies for Sale: Petland Mall of Georgia Has So Many to Choose From! 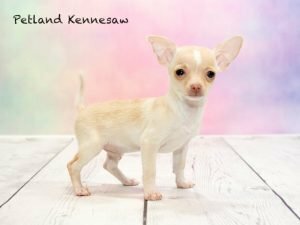 If You’re Looking for Puppies for Sale, Petland Mall of Georgia Has the Best Selection in the State! Petland is so much more than just small animals, birds, reptiles, fish and supplies! Many people don’t realize that we also carry more breeds of puppies than any other location in the state. This includes many different kinds of small, medium and large breed puppies for sale for you to kiss, cuddle and love on! Check out all of our available puppies here! Our puppy socialization rooms make it easy for you and your family to bond with your potential new puppy in privacy. Our knowledgeable Pet Counselors can work with you on which puppies might be right for your situation and environment. We can also advise you on which puppies fit your energy level, so everybody stays happy and healthy! Since we have tons of different breeds, we can definitely find the perfect one for you! We have special packages that will help you take home everything you need to properly train your new pupper. When it comes to housebreaking and teething, you want to be ahead of the curve when it comes to training. You wouldn’t want to sacrifice a new pair of shoes or an expensive rug to an untrained puppy. Our Pet Counselors will walk you through pet ownership in an easy to understand way, so the whole family can be in on the fun! When it comes to the best in vaccinations, wormings and preventative medications, Petland cannot be beat! We believe that to truly stand behind the health of our puppies for sale, they need to have the best medical care available. We also have the highest buying standards for puppies of any other pet retail location. We want to continue to raise the bar for the medical care of both puppies and puppy parents in this industry. Check out more at our Petland Cares website, right here! 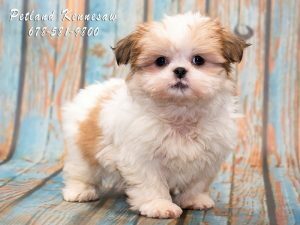 Maltese for Sale, Have You Seen Our Precious Fluffballs? 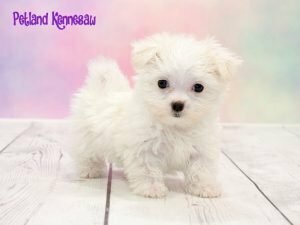 Are You Searching for Maltese for Sale? We Have the Puppies You’re Looking For! The Maltese is a timeless breed that is considered one of the oldest toy dogs still in existence. Originally thought to hail from the island of Malta, the Maltese has graced the laps of many different types of people. Whether they were companions to sailors from the Mediterranean or European royalty, this little white fluffball has certainly stood the test of time! They are sweet, affectionate and loyal to their owners. And their signature white coats and little black button noses have not changed since the beginning and continue to charm people everyday in our store. We even did an interesting facts blog on the Maltese, right here! But maybe you want to know more about the Maltese and what their personalities are like before you add Maltese for sale to your family? Look no further! We want to educate and inform people about what might be the best breed for their families! As the Maltese is a toy breed, they typically stay around 5-9lbs. This also makes them ideal for apartments, condos and smaller environments with or without a yard. The Maltese, despite their diminutive size, are an energetic breed and do need to take walks or engage in playtime everyday. They are typically a quiet breed, when it comes to talking about the toy category, but they will alert you to people at the door or cars in the driveway. Their glorious white coats grow continuously and will have to be brushed daily and groomed regularly to keep it from matting. 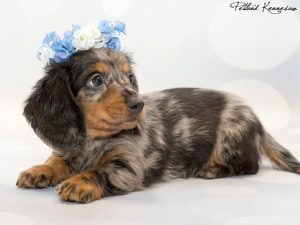 However, they are considered very low-shedders and work well for people with allergies as they have no pet dander typical to other dog breeds. The Maltese is gentle, affectionate, intelligent, responsive and trusting. A good family dog, Maltese are lively, playful, vigorous, and they generally enjoys learning tricks. They can be snappy with raucous children who handle them roughly though and do better with older children. These bullets are just a small bit of information on this wonderful breed! Check out our Maltese breed information page to delve into the world of the Maltese a little more. You can also give our knowledgeable Pet Counselors a call with any additional questions you might have! And, as always, you can check out our available puppies pages to see all of our Maltese for sale in our store!